This is the second in a series of posts about how to get started with brewing your own beer. Last time, I talked about how to select a kit of equipment and ingredients, and how to make wort from malt extract, hops, and water. The next step in brewing is to add the yeast and ferment your wort, turning it into beer. As a reader of this blog, you probably already know that there are two major classes of beer, generally categorized by the type of fermentation and yeast used to make them. Ales typically have yeast that ferment floating on the top of the wort, and ferment at about 60-65 °F, close to room temperature. 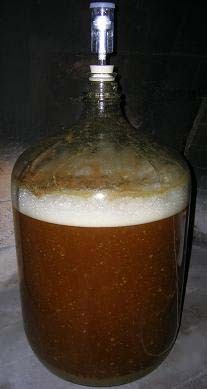 Primary fermentation in ale typically lasts a period of 7-10 days. Lagers, on the other hand, typically have yeast that ferment on the bottom of the wort, with a preferred fermentation temperature of around 45 °F – substantially colder. Lagers also take longer to ferment, with a typical primary fermentation lasting for several weeks (or longer). So what does this mean to the beginning homebrewer? Well, since most people have a room temperature of around 68-72 °F in their homes, it’s far easier to start with an ale (another reason I recommend starting with something like Northern Brewer’s Breakfast Stout). Also, the shorter fermentation time of an ale means you get to drink your beer in a month or so as opposed to potentially waiting substantially longer for your lager. This particular yeast also begins fermentation rapidly and has a good range of temperatures where it will vigorously ferment (57-70°F). All in all, a great robust yeast to start with. Once you’ve cooled your wort to room temperature after the boil, it’s time to pitch the yeast. A temperature of 75 °F or lower is ideal – if you get too much hotter than that you risk killing some of your yeast. There are two basic ways to pitch yeast: You can add the dry inactivated yeast directly to the wort (after sanitizing the packet). Alternately you can rehydrate the yeast first in some warm water or extra wort if you have it an hour or so before the pitch. The process of putting the dry yeast in water reactivates the yeast’s metabolism and begins the growth process (and fermentation, if you’ve rehydrated in a solution with fermentables like malt extract). An alternate way to get a starter culture is to use a “smack pack” which contains nutrients and yeast. You activate it the night before brewing and have an active culture when you’re ready to pitch. Pitching your yeast is the same whether you use a liquid culture or a dehydrated (dry) yeast. Slowly and gently pour your yeast into the wort, ensuring that you spread it around the top surface as much as possible. Seal up your primary fermenter, and you’re ready to go. Most equipment kits will include a “blowoff tube” – a roughly 2 inch diameter flexible plastic tube that you affix to your primary fermenter on one end and submerge the other end into a bowl of sanitizing solution. When the fermentation begins, a foam will build up and flow out of the tube into the bowl. This foam, called the “kraeusen,” contains dead yeast and bitter oils that are a product of the initial stages of fermentation. Allowing the kraeusen to flow out of your beer will generally leave you with a less bitter beer. It’s not strictly necessary to use a blowoff tube, and the kraeusen will generally collapse rather quickly and fall back into your beer within a day or two. When considering whether to remove the kraeusen, it’s important to consider the type of beer you’re making – in this case it’s not crucial either way, but a lighter beer might suffer with too much bitter flavor. If you do use the blowoff tube, be sure to change out the sanitizing solution where the kraeusen exits the fermenter – this is a prime potential spot for contamination to be introduced. Don’t let the dirty water sit there for more than a few hours if you can help it. Primary fermentation will last about a week. You’ll see some bubbles start to come out of your blowoff tube or airlock within a few hours of pitching, and should see vigorous fermentation begin within the next 24-48 hours. Allow your fermentation to continue for at least a week, and don’t proceed until you have seen a the bubbles stop coming out of your airlock/blowoff tube for at least a day. A critical issue here is temperature: make sure to maintain constant temperature of 68-72 °F. Higher temperatures will give you off-flavors from a high ester content and/or biacetyl (I’ll expand on these flavors in a future post), and low temperatures will cause the yeast to ferment more slowly, resulting in an incomplete fermentation after a week. And that’s about it – allow your beer to ferment in a dark area of constant appropriate temperature until the fermentation is done, and you’re ready to bottle! Next time I’ll talk about how to bottle your beer and some of the final finishing steps. You’ll be ready to enjoy it soon!